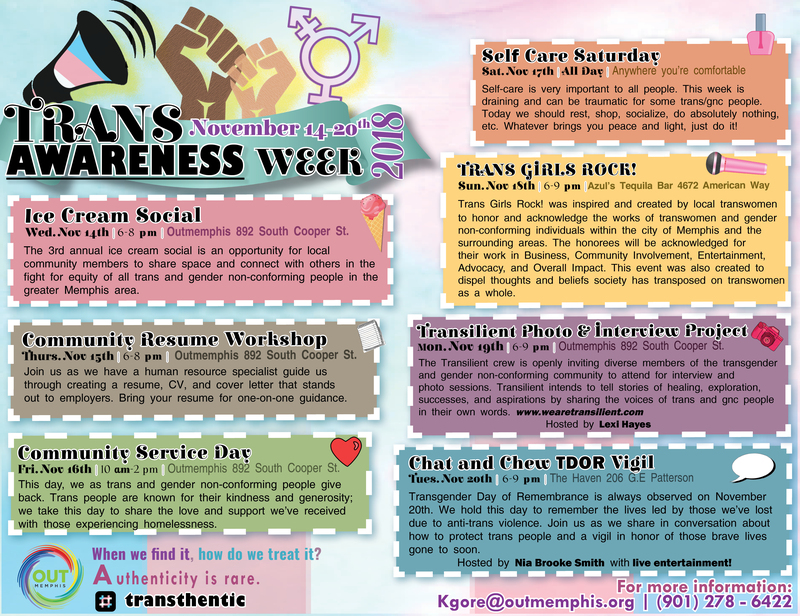 Trans Awareness Week 2018 is fast-approaching, and we have an exciting list of events planned to empower, connect, educate, advocate, and CELEBRATE. 1. Check the flyer above and mark your calendar now! Make sure you don’t miss any of this year’s events. 2. Share the Trans Awareness Week event on facebook and help us spread the word. 3. Want to volunteer? Sign up here if you are a new volunteer and log in here if you already volunteer with us. All events are free for participants! To learn more about the schedule of events and to get regular updates leading up to the kickoff check out the facebook event. Have a specific question? Contact Kayla Gore, Transgender Services Specialist at OUTMemphis, for more information. Want to volunteer, donate, or otherwise support Trans Awareness Week? Contact us here.